Square One Organic Vodka tackles one of the most fundamental oxymorons: how, exactly, can booze be good for you? The concept of organic spirits is relatively new, at least in the popular or commercial sense, even though Americans have gained an appreciation of natural, organic and sustainable products in recent years. Organic booze isn't likely to turn up in health food stores anytime soon, but there’s a wide gap between those brands and their mass produced, high-volume cousins. They are more likely to be made from carefully grown and selected ingredients; production tends to be small-batch, allowing the distiller to devote more attention to detail; they are usually marketed from the ground up, relying on bartender education and targeted retail placement rather than multi-million dollar ad campaigns featuring rappers or supermodels. 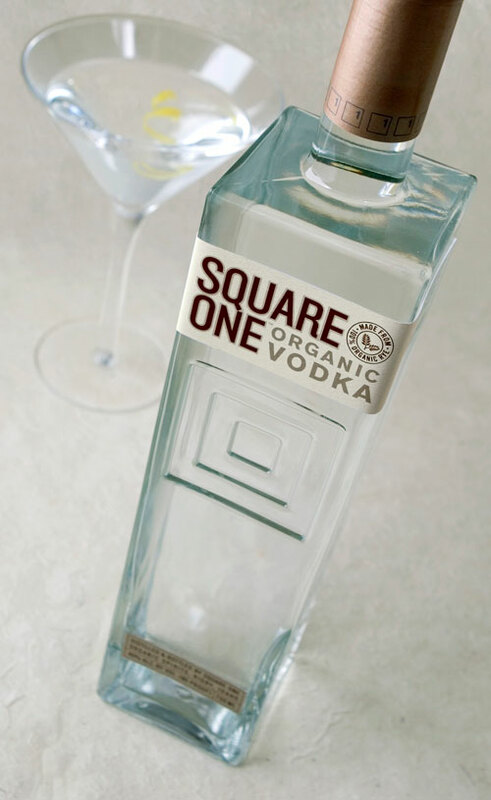 Square One Organic Vodka pioneered the category in a number of ways. The concept wasn’t exactly new---the Sazerac Company had been making Rain Vodka, from organically grown white corn, since 1997. Focusing on vodka (rather than gin, rum or tequila) made perfect sense. Forty million Americans drink it, and demand was likely to increase as a larger chunk of that market became more health-conscious. When it made its debut in 2006, however, it tapped directly into a number of trends that were beginning to loom large in our consciousness. Founder Allison Evanow perceived that cocktails were moving on a parallel track to the evolution of American cuisine. Chefs were either sourcing top-quality ingredients from small farmers, or growing those ingredients in their own gardens. In the best U.S. restaurants, the components of dishes were both regional and traceable. Evanow was committed to creating a “farm to bottle” vodka that would form the basis of culinary cocktails. For starters, Square One is made from 100% rye, rather than corn, potatoes or wheat, with the goal of producing a spirit that has more depth and flavor. It is purchased from selected organic farmers, and goes through a natural process of fermentation and distillation. Most importantly, it gets a single pass through the still. We hear a great deal about triple and quadruple-distilled vodkas, but the truth is that the still can only remove impurities, not add flavor---in fact, each successive trip through a column still strips flavor away. Needless to say, the packaging is environmentally responsible in all the ways one might expect: reusable bottles, “tree-free” labels, shipper cartons made from recycled materials, etc. The most important part of Square One’s marketing, though, is that the brand has truly been built organically as well. The vodka’s launch in 2006 coincided with an explosion of artisanal cocktail bars around the country, and the product has been introduced to those establishments one bartender at a time. Aromas of grain and spice are prominent on the nose of the regular vodka, along with hints of rosemary and citrus essence. The distinct grain quality carries over into the mouth, bolstered by suggestions of anise, orange zest, pepper and mint. The finish is persistent and memorable. The three flavored varieties are Cucumber, Botanical and Basil. The Botanical is easily the most complex of the three. It is labeled not as vodka but as a “botanical organic spirit,” and is infused with eight natural agents such as pear, chamomile, rosemary, coriander and lavender. The first whiff of the nose is reminiscent of gin, with powerful herbal aromas and a strong overlay of citrus peel and lemon. The lemon notes are dominant in the mouth, enhanced by a bouquet of fresh and exotic herbs, and all the elements reverberate on the finish. The Cucumber is disorienting at first---sweet on the nose and slightly bitter in the mouth, with suggestions of pepper, citrus zest and cucumber seed. The Basil is far more intriguing. Intense, appealing scents of fresh-torn basil perfume the nose. In the mouth, the sensation is initially similar to liquid pesto (without the cheese, of course); the taste is clean, and tinged with a hint of lemon. If I operated an Italian restaurant, as I once did, I would feature a martini made from this as my house cocktail. The spirits are line-priced at $35 and available around the country. If you answer to a higher authority, they are OU Kosher as well as organic. In a mixing cup muddle basil briefly with a muddling stick or back of a wooden spoon. Add crushed ice and other ingredients. Shake vigorously for 10 seconds. Strain into a chilled martini glass. No need for a garnish as little bits of basil will be floating in the cocktail. Combine all ingredients (except club soda) into mixing cup filled with ice. Shake very briefly - just enough to blend. Pour into Collins glass and top with soda. Garnish with a pineapple frond stuck into side of glass. Option: add .5 oz. Domaine de Canton liqueur. Combine all ingredients (except soda) with ice in a cocktail tin. Shake and pour into a Collins glass with fresh ice. Top with soda.